Talk about a man being killed by man's best friend. 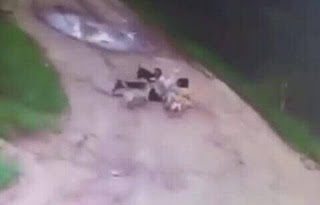 In a gruesome incident involving canines, a drunk man was killed by dogs. He was actually eaten alive by a pack of 12 stray dogs as he walked home. The horrific incident, which was caught on a CCTV, took place in Sovetsky in central Russia’s Khanty-Mansi Autonomous Okrug region. The tragic man, whose name and age have not been released by authorities, actually worked as a security guard. Sad thing is that he regularly fed the stray dogs as he passed by for the past two years. But unfortunately on this day he didn't have any treats for them. And his relationship with the pack turned sour as he attempted to get past them with no food. As the animals attacked him, he tripped and fell, but managed to get back to his feet three times. But on the third time, all 12 canines pounced on him. He reportedly died just two minutes after the first dog attacked. Police investigation into the incident began the following morning after what remained of his body found.